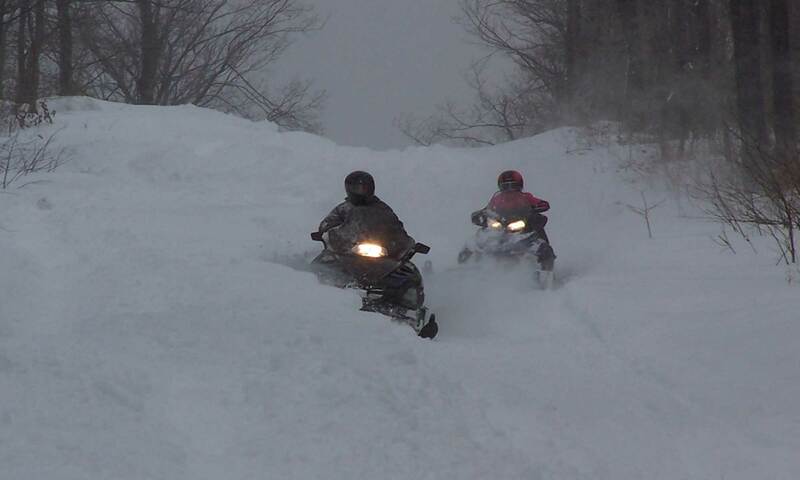 The Black Mo Snowmobile Club, BMC, was organized in 1998 to promote family participation in snowmobiling. Its goal is to open and create trails in Centre County to make snowmobiling safer and more enjoyable for the entire family. BMC is located in Centre County in central Pennsylvania. We work with local, state, and federal agencies to develop connector trails from the Black Moshannon State Forest in Centre County to northern counties in the state of Pennsylvania and to maintain and enhance the current trail system in Black Moshannon. BMC is a member of the Pennsylvania State Snowmobile Association (P.S.S.A). We love to ride and welcome anyone who would like to join us. Members will be aware of and obey all State, Local, and Club rules and regulations. Members will keep their snowmobile in safe operating condition. Members will respect the property and trails they ride on, whether on public or private lands. Members will treat the environment with respect by not littering, by waiting for enough snow cover to protect vegetation, avoid running over trees and shrubs, and appreciate but not disturb animals or other outdoor users. Members will do their best to work with committees and to help out with club activities and events. Members will act responsibly and be responsible for their guests, recognizing that their actions reflect on all snowmobile owners. Club meetings will be held monthly. The meetings are held at at 6:00 pm in the YMCA Annex which is located in Bellefonte, PA.
Only members in good standing are entitled to vote. If an occasion arises that cannot wait until the next regularly scheduled meeting, the President can call an executive session. All decisions at an executive session are binding unless overridden by a two-thirds vote at the next regularly scheduled meeting. Family Membership: Includes all husbands, wives, and all children up to the age of eighteen. Individual Membership: Includes individual members eighteen years of age or older. New members must submit application and payment to the club secretary. At next regularly scheduled meeting their application for membership is voted on requiring a two-thirds majority of those present. Membership size, or curtailment thereof, must be advertised in the monthly newsletter before it can be voted on at a monthly meeting. A two-thirds vote of those in attendance is required to limit membership size. The executive committee will deal with violations of the constitution and bylaws. All members must be a P.S.S.A. member. Membership will be maintained the following year until February 15, at which time, non payment of dues will result in the membership lapsing for the year. Reinstatement can be made by paying the full amount of the dues owed for the year. Dues taken from the beginning of August will be for the next years dues. Family Membership: For paid up members eighteen years of age or older in good standing, husband and wife get one vote. Individual Membership: Paid up members eighteen years of age and older in good standing receives one vote. Officers are elected for a term of two years. Nominations are held at the monthly meeting in August. The nominations are advertised in the September monthly newsletter to come out before the September meeting. Nominations will be opened again at the September meeting. With no further nominations, elections can be held with the new officers taking over at the end of the meeting. If more nominations are accepted, advertisement of all nominations, ones made in August and ones made in September, will be advertised in the October monthly newsletter to come out before the October meeting. Elections will then take place at the October meeting with the new officers taking over at the end of the meeting. Voting on officers can be by ballot or show of hands. The president will ask if anyone objects to voting by show of hands. One objection will warrant voting by secret ballot. In the event there is only one candidate for each office, the president will direct the secretary to cast a ballot containing the names of those nominated, making their selection unanimous. Nominations will be accepted from the floor if those persons are present to accept or decline. Nominations will be accepted without the person being present if a handwritten note accepting the nomination is turned in to the vice president upon the nomination. The vice president will verify the accuracy of the note by contaction the individual nominated prior to the newsletter coming out. The newsletter will report the findings of the vice president. If a vacancy should occur during a regular term, the executive committee will make an appointment to fulfill the term. Shall preside at all meetings of the Club. He/She will decide all points of order that may arise during the meeting. The president will not vote on any matters before the Club or executive committee except in the case of a tie. Then the president will have the deciding vote. The president will be an ex officio member of all committees. The president will be an ambassador for the Club. He will conduct himself/herself with dignity and honor putting the Club and the sport of snowmobiling in a positive light with the general public. He/She will promote the Club as much as possible by bringing as much good publicity about the the Club to the attention of the general public. At all times while representing the Club, the president will conduct himself/herself above reproach. Will assume all the powers and authority vested in the office of president in the president’s absence or inability to fulfill his/her duties. In addition, the actions of the vice president, while representing the Club, will be in such a manner to support the president in promoting the Club and the sport of snowmobiling in a positive light with the general public by conducting himself/herself above reproach. The vice president will assume all the duties of the office of president in the event of the president’s death, resignation, or removal from office. The secretary will record all proceedings of the Club. At monthly meetings, the secretary will report on the proceedings of the previous meetings. He/She will maintain any records required by the Club. It will be the duties of the secretary to send out all notices to members of the Club. The secretary will receive and answer communications, read all notices received and sign all notices by the Club. It is the duty of the treasurer to pay bills presented to him/her that is authorized by the club membership at a monthly meeting, the executive committee, or routine expenditures from an approved budget. The treasurer will keep a record of all money received and disbursed. The treasurer will read a report of all receipts, expenditures, and balances of all accounts at every monthly meeting. At the close of his/her term, the treasurer will submit a report and all records belonging the the Club. The books will be approved by the membership on reccomendation of the executive committee at which time they will be turned over to his/her successor. Member at large of the executive committee will be an elected position. His/Her job will be added input in executive meetings. No executive meeting can be held without first notifying the member at large. Will consist of all officers, president, vice president, secretary, treasurer, and member at large. The duties will consist of taking care of any business that because of its urgency cannot wait for the next monthly meeting. It will be the duty of the president to call such a meeting and he/she will preside at such a meeting. Three of the five members of the executive committee must be in attendance to make a quorum. The business of the executive meeting can be conducted on the phone.